In the song “On the Banks of the Ohio,” a man asks his love to take a walk with him so he can propose. He wants to know that she will love only him, and lay “entwined” in his arms alone. When his beloved refuses to speak and instead turns her “head away,” the man has an answer to his proposal. He becomes so enraged by his lover’s rejection that he murders her. When I first saw the painting, I didn’t know the backstory or about Mr. Davis’s interest in ballad music. I was simply pulled in by the gaze of the woman and the expression on her face. 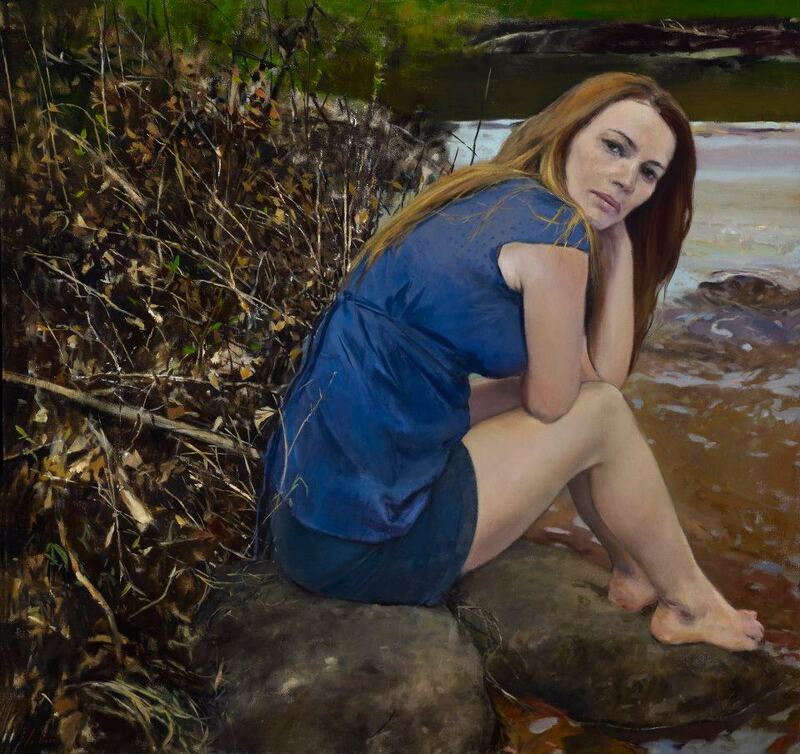 When other details washed over me—her dark red hair, her tied-back blue shirt, the rounded shapes of her arms and legs, the dark river and landscape—I just felt more strongly drawn to the painting. But it was the gaze that first captured me and commanded my attention. 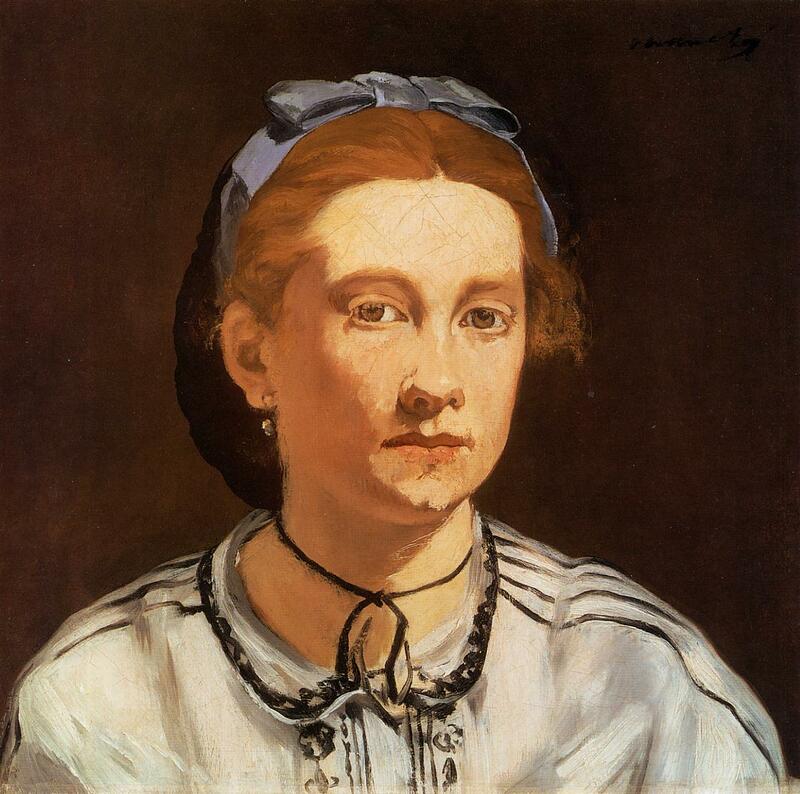 It compelled me to go on looking in the same way the gaze of another redheaded woman compelled me: Manet’s portrait of Victorine Meurent. I know the paintings are separated by 150 years. I know their subjects have nothing in common. Maybe it’s not even helpful to compare. But by thinking about both paintings, I’ve come to understand something. I think both women display a fierce kind of dignity. An acceptance of the moment but also a refusal to please. I see a certain bluntness in each gaze, as well as reservation and perhaps even sadness. Both women are self-contained. Each is, in her own way, defiant. Their gazes transfix me, but there is no invitation forthcoming. Each is the woman who allows others to see but not to know. Each is the woman who will not be possessed. Sometimes I see things differently when I look at them up-close, so I took the liberty of zooming in on the paintings and slightly altering the angle of Davis’s painting. The context of is lost, I know, and I hope Mr. Davis will forgive me. What was each model thinking of when she was painted? Where did she go in her minds in order to reveal this interiority—and to keep a part of herself from us, the viewers? This is an idea I explore in Paris Red: what Victorine Meurent did as a model to give to Manet the many different faces she presented. And in Part 2 of this blog post (coming next week), I’ll talk about what Julyan Davis told me about his painting. Visit www.julyandavis.com and www.murderballadpaintings.com to learn more about Julyan Davis. Oh, how I wish I could be in two places at once. I’ll be at the Community Bookstore on Friday, April 24 for a reading and conversation with Brigid Hughes from A Public Space, but I will lift a glass of champagne to Julyan Davis and Eno Gallery!